Based on my experiences with Energy Healing and Angel Intuition, I tend to approach Health Readings in one of two ways. Both of the techniques involved mental, emotional spiritual and physical considerations. 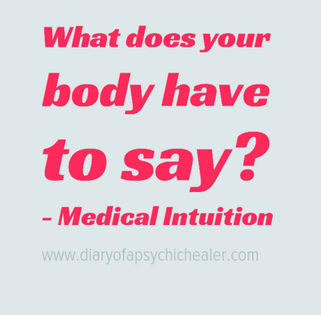 The First is Medical Intuition where, as a Healer, I tune into my client’s chakras, body and organs to get a sense of what might be going on in their life. If a person has anger issues or maybe they’re at a loss of control, we can sense that in the liver and the Solar Plexus Chakra. Next we send healing to the body, encourage it to release that energy and ask for clues about behavioural changes that might heal the issue. So for example, the Solar Plexus chakra may ask for clear boundaries, the Heart may encourage us to be more compassionate and generous. At the end of the healing session I typically raise these issues with the client to see if they fit. The idea is to give them some perspective and hopefully tools to heal themselves. This works best for me in person, when it’s easier to sense the body’s energy. We can also learn to read our own energy. Go to the Online Lessons tab to sign up for a workshop. Start by grounding, clearing your energy and protecting the space around you. A simple healing meditation will do; visualise tree roots anchoring you to the ground, a shower of light clearing your aura and finally, a bubble of protective light surrounding you so that only “good” angels and high vibrational healing guides are able to pass on intuitive messages. Shuffle the cards, choosing three and turning them over one by one. The first card is where we are now, the second gives us advice, and the third is where that advice can lead us. We intend to receive messages that empower and guide us. So for example, you might be prompted to take better care of yourself, to get a second opinion or to redefine boundaries. Make note of any feelings, impressions or thoughts that flash through your mind. Sometimes the message will be spelled out on the card, but more often than not, your eyes will be drawn to a minor element that comes to life in your mind. Let your sixth sense guide you as you interpret the message. You can always post the card on my Diary of a Psychic Healer Facebook Page (here) and ask the group for help with the interpretation. It’s also worth mentioning that most Healers are not doctors, and they won't have the expertise to advise on treatment options. Instead, ask for messages about therapies that can complement medical care so that your emotional and physical needs are met. That said, sometimes the cards will indicate the need for a second opinion, suggesting we change physicians or ask another doctor for advice. Personally, I appreciate the value of second opinions. Ten years ago I went to an orthopedist who misdiagnosed severe leg pain as a “bad cramp.” Three weeks later I wasn’t getting any better, despite bed rest, physical therapy and other recommendations. I finally went to a new doctor who correctly diagnosed my pains as Deep Vein Thrombosis. I was put on blood thinners and the clot dissolved. Diagnosing medical conditions isn’t easy, and second opinions can help us out by building on a broader base of experience and knowledge. 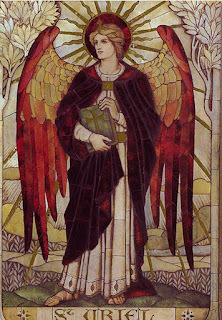 My next post will include examples of Angel Card Readings, stay tuned!